This coming week is Memorial Day weekend followed by the Jewish holiday of Shavuot. Which means plenty of good eats are around! The holiday of Shavuot commemorates the day God gave us the ten commandments on Mount Sinai. Except my brain defaults to childhood mode and likes to call it the Holiday With Allll the Dairy Desserts! Cheesecake, rice pudding, blintzes, the works! It’s one of my favorite holidays because anything involving cheesecake wins my heart. This year though I wanted to try something new. No worries, cheesecake is still on the menu. But I also wanted to create something that is delicious while simultaneously providing your body with nourishment. Something that you can even have for breakfast and it will make you feel good. And I’ve got just the thing that fits the bill! 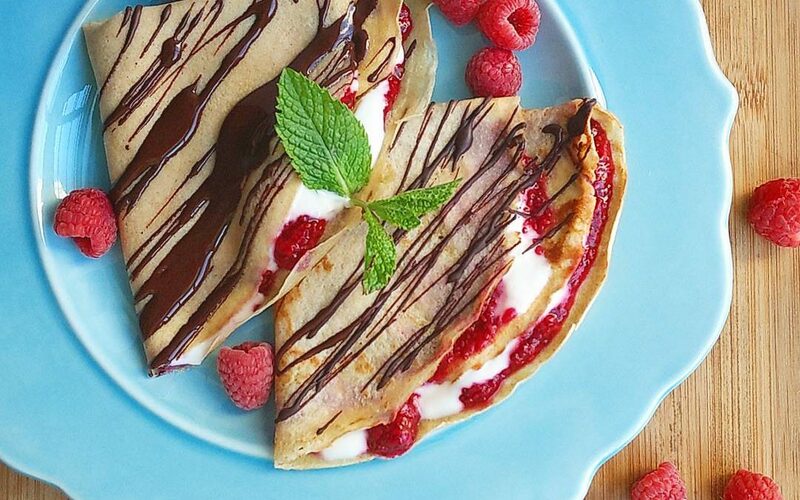 Say hello to Raspberry Jam Crepes! Not gonna lie, these were way too much fun to create. Especially the taste testing. You know, for quality assurance. And I can tell you, it is so good! These crepes are bursting with a bright raspberry flavor that blends well with the creamy vanilla yogurt filling which are perfectly packaged in a light thin crepe. You know what I love even more? How nutrient dense it is! The Raspberry Chia Seed Jam provides you with fiber and heart healthy fats while the greek yogurt incorporated into the creamy filling adds a boost of protein. Whether you are looking for a Memorial Day breakfast that will impress, or for something nutritious and delicious to get into full swing with the Dairy Holiday, these beauties will do just that. You should know though that these are not exclusive to breakfast. Or to Memorial Day and Shavuot. They make a gorgeous brunch meal or a lovely dessert. What’s certain is they will make you and your body happy any time of year! Stir in chia seeds and maple syrup and mix well. Place in mason jar, cover, and allow to thicken in the fridge for 1 hour or more. Optional: melted 72% dark chocolate for drizzling, unsweetened whip cream (using heavy cream), mint leaves. Place all ingredients (except for chocolate, whip cream, and mint leaves) into a blender. Blend on high for 10 seconds (no more than that). Trasfer batter to a bowl. Cover and place batter in the fridge while you make the fillings. When ready to make crepes, heat a crepe pan (or any medium size pan) to medium heat. Coat pan with butter or avocado oil (if using avocado oil, you can spray it for best results). Pour ¼ cup crepe batter at at time onto pan and quickly, in a circular motion, spread the batter evenly to create a perfectly round and thin crepe (you want it to be as thin as possible). Cook until the edges start to curl up (about 45 seconds). Flip and cook another 10 seconds (that’s all it needs, it’s a very thin batter). It is easiest to flip it using your fingertips. But if you have those pancake-like flipping skills go right ahead. Once all your crepes are made start filling them. Spread 1 tbsp raspberry jam onto half of the crepe. On top of that spread 2 tbsps creamy filling. Fold crepe over once, then fold over again to create a triangle shape. Plate and serve with (optional) drizzle of melted chocolate, a dollop of unsweetened whip cream, and garnish with a mint leaf. Now all there is left to do is dig in, enjoy!